William D. "Shad" Alberty, 61, died February 20, 1996, at home…He served with the U.S. Army and attended East Carolina University. 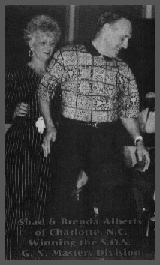 Mr. Alberty was well known in the field of dance, and his contributions to the shag world were numerous. He was instrumental in the resurrection of the shag in the late sixties and early seventies with shag contests throughout the Carolinas. He began teaching couples this dance of the Southeast and according to some had taught more students than any one else. Perhaps one of his most famous students was Academy Award winner, Robert Duvall during the time he was filming in Darlington, SC in 1990. The Nationals Shag Dance Championships Board of Directors was a planning to bestow upon he and his wife, Brenda, the "Promotion of Shag" award on March 8, 1996 in Myrtle Beach, SC. Winners of many contests throughout his career, he and his wife were the first "Masters" champions in both the National Shag Dance Championships in 1994 and the 1995 S.O.S. Grand Nationals in Atlanta last May. A winner of many prizes, trophies and cash, he also won trips to London, New Orleans, Mexico, Las Vegas and several Caribbean cruises. Mr. Alberty was a spectator, preliminary and finals judge, teacher of participants and contestants in both Professional and Masters divisions, and was a presenter of the Masters trophy last year. He was a member of the Shaggers Hall of Fame. Most recently he appeared with his wife on ABC's "Good Morning America" in June of 1994 with Spencer Christian and the Gatlin Brothers. He also filmed lead-ins for "CBS This Morning" advertising the Grand Strand and the P.G.A. Seniors Golf Tournament. He danced at the Annual P.G. A. Banquet last year before the top golf professionals in the world and received a standing ovation. Articles will appear this spring throughout the Southeast pertaining to his involvement. He will be featured in "Expressions," Myrtle Beach Jet Express' inaugural inflight magazine edition and the "Sandlapper" magazine, a South Carolina low-country magazine. The next issues of "Carefree Times," the S.O.S. publication, and "Shagger" magazine will carry a feature article…. He was a showstopper, and from the Carolinas coast to Atlanta and Richmond, anyone who knew shagging knew Shad Alberty. His feet had a touch of Astaire, a magical touch. It was like gravity didn't know what to do with them, when he and his partner, usually his wife, Brenda, began their sweet, synchronized steps. At one time he was the king shagger. But William D. Alberty's feet dance no more. He died Tuesday after a long illness. He was 61. "Between his exposure - his teaching, his longevity and just being active in shagging - he was probably the most recognized dancer on the beach music planet," said Randy Rowland, who owned Groucho's, a Charlotte beach club where the Albertys taught their steps to thousands for nearly 18 years. "He lived and breathed it." Alberty grew up in Greensboro, and became friends with older teen-agers who shagged and would often take him along to the N.C. coast, usually the Atlantic Beach-Morehead City area, where he's watch and mimic. But soon he was adding his own steps to a growing repertoire. Rowland had heard about Mr. Alberty's skills for years before meeting him Easter weekend 1969 at a Myrtle Beach party. All the furniture was pulled back to the walls, the rug rolled up, and everyone began to shag. But then Alberty got on the dance floor. "Everybody stopped to watch," Rowland said. "I was awestruck. I could shag, but thought, 'Why can't I do that?' At that time he was one of the best five or six dancers around." Some say Alberty taught more people to dance the shag than anybody else, including actor Robert Duvall while he as filming in 1990 in Darlington, S.C. When Alberty got on the floor, people stopped. And watched. And smiled. "Shad was very graceful," said Skipper Duke, who ran a beach music club in Wilmington. "He had a tremendous repertoire. He had a lot of Fred Astaire in him. Don't let anybody kid you, but I guarantee he studied Fred Astaire. At one time, he was a good as there was." It was the dance contests, which Alberty helped start, that pushed him to get better. He won hundreds of prizes, cash and trips to New Orleans, Mexico and Las Vegas, and several Caribbean cruises. He could toe with the best right to the end. In May, he and Brenda won the S.O.S. Grand Nationals in Atlanta in the "Master's" category. He and Brenda were inducted into the Shaggers Hall of Fame. Chicken Hicks of Wilmington met Alberty in the early 1980s as shagging was making something of a comeback. Hicks himself is a shagging legend, and the first time he saw Alberty dance he knew he was watching someone special. "He was unique," Hicks said. "He was doing things I'd never seen before. And that's something they can't teach you. You've got to have some of it in you." Duke remembers when he asked Alberty to help him with his first contest at his club. Alberty told him to require the contestants to dance five specific steps. "I almost didn't get any dancers to show," Duke said. "Nobody knew how to do those steps. They were all Shad's." In addition to his wife, survivors are his daughters, Mitzi A. Shirley of Lake Wylie, S.C., and Teri A. Wilson of Rock Hill; and a granddaughter. Memorials May be made to Hospice at Charlotte, 1420 E. Seventh St., Charlotte, NC 28204.